Today, March 8, 2012, is International Women's Day and for the occasion I would like to write about Kadra Maysi, a woman with an exotic sounding name but solidly Southern in origin. Katherine Drayton Mayrant Simons was born on January 21, 1890, in Charleston, South Carolina. As a writer, she used the pseudonyms Drayton Mayrant and Kadra Maysi, a contraction of her four names. She seemingly wrote in every form: novels, short stories, non-fiction, verse, drama, articles, reviews, and even a sketch for a ballet. Her first book, Shadow Songs (1912), a collection of poems, was issued a century ago. She followed that up with more volumes of verse, plus nine novels, two plays, and two collections of historical sketches. Katherine also contributed to the Charleston News and Courier and Names in South Carolina, a compendium of place names and histories, between 1955 and 1969. According to Find-A-Grave, she was the only woman elected president of the Poetry Society of South Carolina, and she won a number of awards from the society. She was also member of the John Doyle Writing Group. Under the name Kadra Maysi, Katherine wrote three stories for Weird Tales. All have intriguing titles: "The Boat on the Beach" (Dec. 1930), "Conjure Bag" (Apr. 1932), and "The Isle of Abominations" (Oct. 1938). Although I have not read them, "Hag-Hollerin' Time," a poem from the 1939 Halloween issue of The Saturday Evening Post, and "The Lost Atlantis," a ballet performed by the Charleston Civic Ballet Company in 1964, sound like they might also fall into the category of fantasy. Katherine also contributed to The Art World, Contemporary Verse, The Lyric, Sea Stories, and Grit. I'll list her books in a future posting. Although she traveled to Europe and Bermuda, Katherine Drayton Mayrant Simons seems to have stayed close to home for most of her life. Much of her work concerns her native state, its people, and its history. That state rewarded her with a doctorate in literature from Converse College, a women's college located in Spartanburg, South Carolina. Katherine Drayton Mayrant Simons died on March 31, 1969, in the city of her birth. Where you took the courts of Bagdad, there you took the courts of dream! Underneath the cursed marching of the Christians in the street? Do you smell the orange blossoms and Damascus roses sweet? With a heavy scent of attar and a sheen of cloth-of-gold? Or the key to mosque and chamber such as Scherezade told? Do you follow as the byways of the secret gardens lead? Have you found, bewitched, a princess hid in a pomegranate seed? When you took the courts of Bagdad, then you took the courts of dream. Note: I have done my best to reconstruct this poem from a jumbled Internet source. If you find errors in it as it appears here, please let me know. The website Find-A-Grave offers a biography based on Katherine's obituary. It also has a photograph of her headstone. There are other sources on the Internet as well. "The Boat on the Beach," a ghost story that passes into the realm of the weird story, was reprinted in 100 Wild Little Weird Tales, selected by Robert Weinberg, et al. (Barnes and Noble, 1994). 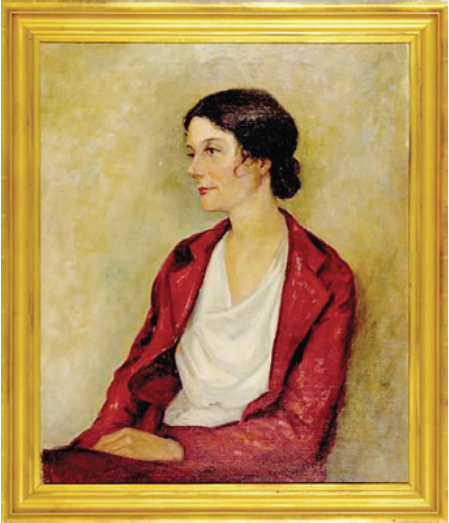 Katherine Drayton Mayrant Simons, a portrait by Georgia artist Anne Nash (1884-1968). Thanks to Francesca di Colloredo for suggesting this observance of International Women's Day. I'm trying to find out what her book "Always A River" is about. If anyone has read it, could you give a brief review or the plot or the setting or something?